GILAS Pilipinas will cross paths with rival Thailand and host Malaysia right in the basketball preliminaries of the 29th Southeast Asian Games in Kuala Lumpur, Malaysia next month. The defending men’s champion leads the cast in Group A along with the Thais, Malaysians, and Myanmar. Indonesia, runner-up to the Philippines in the last edition of the biennial meet in Singapore two years ago, banners Group B along with bronze medal winner Singapore, Vietnam, Laos, and Cambodia. With the exception of Laos and Cambodia, the rest of the countries saw action in the 2017 Southeast Asian Basketball Association (Seaba) championship held in Manila last May, where Gilas Pilipinas routed Indonesia for the gold medal. Schedule of games, though, have yet to be finalized by the Malaysian Organizing Committee. This year’s SEA Games basically follows the same format two years ago. The top two teams from each group advance to the crossover semifinals, with the winners disputing the gold medal in a winner-take-all match. “I think that’s the rule they have now in the SEA Games. Eight or nine teams in a competition will be divided into two groups,” Gilas team manager Butch Antonio explained to SPIN.ph. The official draw for all sports was held during the weekend in the Malaysian capital. Gilas retained the basketball gold two years ago under coach Tab Baldwin, but went through the wringer against Thailand (semifinals) and Indonesia (finals) before coming out unscathed at the OCBC Arena in Singapore. It was the 17th basketball gold for the Philippines in the biennial meet. 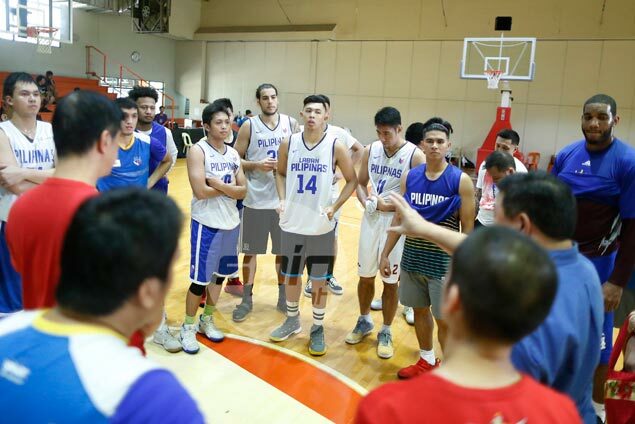 Kiefer Ravena, Kevin Ferrer, Baser Amer, Almond Vosotros, and Troy Rosario were members of that 2015 team that will be back for another tour of duty with Gilas for the August 19-30 meet. The five will be joined by Bobby Ray Parks, Kobe Paras, Mike Tolomia, Von Pessumal, Carl Bryan Cruz, Raymar Jose, and naturalized player Christian Hardinger. Games will be played at the MABA Stadium. Unlike the men’s competition, the women’s side will have a single-round robin format, with the team to emerge with the best record winning the gold medal. Coach Pat Aquino said Laos is the only country yet to confirm if it would field a team, but the rest of the cast would be there led by defending champion Malaysia, perennial gold winner Thailand, Indonesia, Singapore, and Vietnam. Perlas Pilipinas will be gunning for a first ever gold medal in the meet, its campaign buoyed by its historic promotion to Level 1 of the FIBA Asia Women’s Cup, where the team will be competing next week in Bangalore, India. Seeing action in India includes team captain Allan Lim, Afril Bernardino, Raisa Palmera-Dy, Camille Sambile, Claire Castro, Jack Animam, Gemma Miranda, Andrea Tongco, Chack Cabinbin, Janine Pontejos, Cindy Resultay, and Amby Almazan.